Consider the following Crowdology review to learn more about the company, their legitimacy, how they work, and what rewards you can earn for participating. More so, this Crowdology review will touch on issues and complaints from actual users such as issues receiving any sort of work from the website. By the conclusion, you should have all the information needed to determine if this website is a good choice for you. Crowdology is a steadily growing online panel designed for market research. As a member of Crowdology, you will get invited to complete paid surveys. Is Crowdology Legit or a Scam? In spite of the complaints from members, Crowdology cannot be considered a scam website. You do not have to spend money to sign up for an account, which is a major selling point for legitimate websites. Also, there have been users who report that they have received cash for completing tasks. Sign-up: When you sign up for a Crowdology account, you will fill out the usual information (e.g. name, age). Be sure to fill in your profile as thoroughly as possible and keep it up to date concerning your interests, hobbies, etc. Invites: Once your profile is filled out, you will begin to receive invitations to take surveys via your email address. You will only receive requests suited to you based on the information you provided in your profile. Surveys: Typical surveys range from 5-10 minutes, but the length can change based on the subject matter. The company claims to want to keep the reward process simple and straight to the point. Gift Certificate: You can turn the cash earnings you receive from completed surveys into an Amazon Gift Certificate that is usually worth $10. 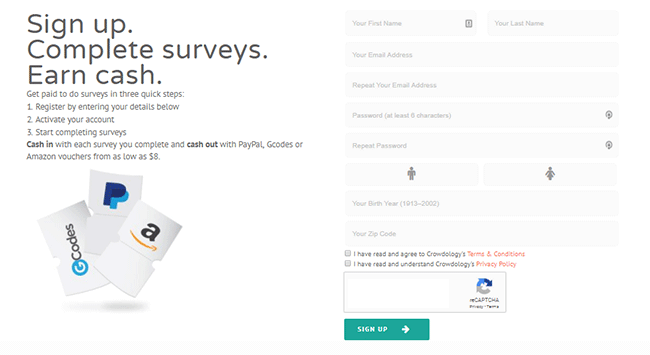 Cash: Each time you complete a survey, you receive cash. The minimum amount you can withdraw to your PayPal account is $8. Crowdology only pays out to PayPal, so it’s necessary to have a valid PayPal account. When researching for this Crowdology review, a few common praises and complaints came up. PayPal payout: PayPal is one of the safest methods of payouts from websites such as Crowdology. As PayPal has its own security, there is little reason to worry about anything happening to your earnings. An important thing to keep in mind though is that PayPal does charge a 2% handling fee. 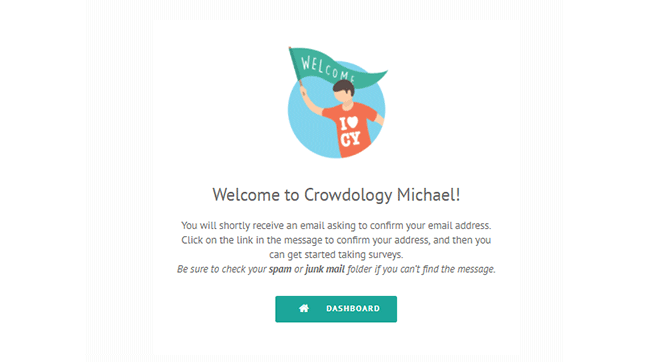 Minimal surveys: One of the biggest complaints users have about Crowdology is the minimum amount of surveys available. Some may not receive invites for months, while others can take a survey for a certain amount of time before being locked out of it. There are a good number of complaints against the company concerning the surveys. Many users do not receive many, if any, surveys. The company claims it is due to not being qualified, and they recommend enhancing your profile to improve your chance of being eligible for different surveys. In addition, some users claim to have not received payments for surveys completed. When issues such as that occur, the only thing you can do is contact Crowdology directly for support. If that does not lead anywhere, you can reach out on social media to see if other users are encountering the same problems. Contact Form: On their official website, you can fill out a Contact Form. Crowdology claims to respond to it within 24 hours. Social Media: Crowdology is active on both Twitter and Facebook. You can visit those pages to send messages in case you cannot get in contact with them on their official website. It is also a good way to reach out to other users and see if they are experiencing the same problems and know of any solutions. To conclude this Crowdology review, this online market research panel appears to be a popular choice. Completing the surveys pays in cash, and you can payout using PayPal or turn that cash into an Amazon gift card. However, there are complaints about how difficult it is to become eligible for any surveys, and some have claimed to not receive cash. Although Crowdology has not been deemed a scam, those issues with payments are something to keep in mind before signing up for the website. If you have joined and participated in Crowdology, let us know in the comment section how your experience was with the company.